“Wait for caster to heal HP”? Probably make the other serpents later, to complete the anti-horse types, here’s Hvitrwolf and Svartrwolf. 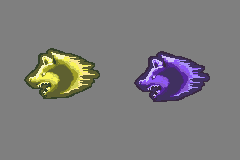 Also, fixed version of the rest of the other 3 wolf spells added when using a follow up attack. hey the what hack is the animation of is mage? It’s a Mage Lord of a project of mine. the reaver spell from Fates. It’s a anima spell, may make the dark & light version later on. honestly i feel that the tempest animation makes for a better tornado spell then the tornado animation.